Networking guru Susan RoAne shows readers how to exploit chance to create a bigger network of contacts, friends, and acquaintances—the key to new life opportunities. In How to Create Your Own Luck, she reveals the eight traits of successful people who make their own luck, rather than wait for it. Filled with engaging and instructive stories of real people who’ve turned serendipity into success, her book focuses on the eight counter intuitive traits that they all have in common, including talking to strangers, making small talk, dropping names, and even eavesdropping. 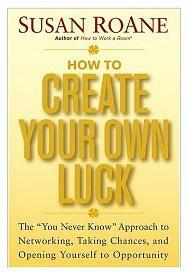 This handy, real-world guide reveals the practical ways that anyone can create their own luck—opening up new opportunities in every aspect of life. Chinese lanterns for a party! Lucky Chinese Horoscope Gem Stones..
Black Cat - Bad Luck?